Al-Farsi K. Multiple Myeloma: An Update. Oman Med J 2013 Jan; 28(1):3-11. Multiple myeloma (MM) is a malignant disorder characterized by uncontrolled proliferation of clonal plasma cells causing a wide variety of complications leading to organ dysfunction and eventually death. Since the report of the first case of myeloma by Solly in 1844 and the case of Thomas Alexander McBean whose urine was examined by Henry Bence Jones, there has been a steady increase in the number of reported cases of MM.1 Recently, there has been a dramatic improvement in our understanding of the pathogenesis of myeloma leading to major advances in the management of patients with MM. This review summarizes the latest advances in the diagnosis, staging, prognosis and management of MM incorporating results of major landmark trials and recent international consensus guidelines. The malignant cells produce monoclonal immunoglobulins or light chains. The expanding clone replaces the normal BM leading to anemia and other cytopenias. The malignant cells also cause inhibition of osteoblasts and stimulation of osteoclasts leading to the appearance of lytic bone lesions. This is mediated through an increase in RANKL (receptor activator of NFκB ligand), which stimulates osteoclasts and a decrease in its inhibitor osteoprotegrin (OPG). MIP-1 alpha (macrophage inflammatory protein-1 alpha) and IL-6 also stimulate osteoclasts. Increased levels of DKK1 (dickkopf 1) inhibit osteoblasts. Inhibition of osteoblasts explains why alkaline phosphatase levels are not increased and why radionucleotide bone scans are not helpful in these patients. The increase in osteoclastic activity also explains the hypercalcemia seen in these patients. Renal insufficiency in MM is mostly caused by cast nephropathy (tubular damage and obstruction resulting from binding of light chains to Tamm-Horsfall mucoproteins). Other causes include amyloidosis, light chain or heavy chain deposition disease, plasma cell infiltration and interstitial nephritis. Other potential causes include: volume depletion, hypercalcemia, hyperviscosity, nephrotoxic drugs (e.g. NSAIDs), contrast nephropathy, infections, bisphosphonates and hyperuricemia. The production of dysfunctional immunoglobulins, suppression of uninvolved normal globulins, abnormal lymphocyte function and leukopenia all lead to immunoparesis and recurrent infections. High levels of immunoglobulins can lead to hyperviscosity (typically when serum viscosity is >5 centipoises) causing headache, blurring of vision or even coma. Accumulation of free light chains in tissues can lead to amyloidosis. Fig. 1 illustrates the pathophysiology of the different clinical manifestations in MM. Figure 1: Pathophysiology of MM. PCs: plasma cells, RANKL: receptor activator of nuclear factor Kappa B ligand; OPG: osteoprotegrin; MIP-1: macrophage inflammatory protein-1 alpha; IL: inter-leukine; Igs: immunoglogulins. Patients generally present with bone pain (60%), fatigue (30%), weight loss (25%), paresthesia (5%),9 and recurrent infections (particularly pneumonia and urinary tract infections) with streptococcus pneumonia, Hemophilus influenza and Escherichia coli being the most common causative agents. Examination may reveal fever (0.7%), hepatomegaly (4%), splenomegaly (1%) and lymphadenopathy (1%).10 Pulmonary and pleural involvement are rare except in advanced disease.11 Cardiac involvement is seen with accompanying amyloidosis. Extra-medullary plasmacytomas are seen in 7% upfront and up to 20% at relapse.9 Cord compression (caused by an extra-medullary plasmacytoma or bony fragments from vertebral fractures) is rare (5%). Peripheral neuropathy is also rare at initial presentation and suggests amyloidosis or POEMS syndrome. Anemia (mostly normocytic normochromic) is seen in 75% of patients. Peripheral blood examination shows increased background staining and rouleaux formation. Circulating plasma cells and a leuko-erythrobalstic picture are occasionally seen. Because of increased immunoglobulins, the ESR is high: >20 mm/hour in 85% and >100 in one third.10 Elevated creatinine is seen in 50% and hypercalcemia in 25%.10 Urinalysis is typically negative (Bence-Jones proteins are not detected by dipstick) unless there is amyloidosis or light chain deposition disease leading to albuminuria. Also, 24-hour urine is required for quantification of monoclonal proteins (M- proteins) or light chains. An M-protein and/or light chain in the serum and/or urine is found in 97% of the patients. These usually present as a single peak in the gamma (or beta or alpha-2) region on densitometry or as a discrete band on agarose gel electrophoresis. Immunofixation (IF) is used to confirm their presence and determine their subtype. A serum free light chain (FLC) assay is useful in detecting patients with no monoclonal bands on electrophoresis and/or IF.12 Myeloma is classified into different types depending on their immunoglobulin heavy chain and light chain as follows: IgG (52%), IgA (21%), light chain (16%), Bi-clonal (2%), and IgM (0.5%), while IgD and IgE are rare.10 Patients with light chain myeloma are more prone to develop renal failure. About 3% of patients have non-secretory myeloma. BM aspirate and biopsy show increased numbers of clonal plasma cells. Immunophenotyping using flow-cytometry and immunohistochemistry is important in proving clonality and can also provide some prognostic information. Myeloma cells are typically CD79a. VS38c, CD138, and CD38 positive. Occasionally, they are CD20 positive; seen in patients with t(11;14). Cytogenetic studies (karyotype and FISH) can reveal one or more of the genetic changes described earlier. On skeletal surveys, 80% of patients will have lytic lesions, diffuse osteopenia or fractures at diagnosis. These most commonly involve areas of active hematopoiesis (vertebral bodies, skull, thoracic cage, pelvis, and proximal humeri and femora). Osteosclerotic lesions are rare. Bone scans are not helpful. Contrast-enhanced CT scans should be avoided (renal toxicity). MRI can detect diffuse and focal BM lesions in 50% of those with negative skeletal surveys. MRI is also used in patients with suspected cord compression. The use of the gadolinium-based imaging should be avoided if GFR is <30 mL/min (risk of nephrogenic systemic fibrosis). PET scans correlate with areas of active lytic lesions but their use remains investigational. Fig. 2 demonstrates some of the features seen in MM. Myeloma is suspected in patients presenting with back pain, other bony pains, unexplained anemia, renal insufficiency and/or hypercalcemia. The diagnostic criteria for MM,14 put emphasis on the presence of otherwise un-explained end-organ damage (CRAB: hyper-Calcemia, Renal insufficiency, Anemia and Bony lesions) in patients with M-proteins/light chains and clonal plasma cells (Table 1). The differential diagnosis includes MGUS, smoldering myeloma, solitary plasmacytomas, plasma cell leukemia (PCL), AL amyloidosis (primary amyloidosis), POEMS syndrome (Polyneuropathy, Organomegaly, Endocrinopathies excluding diabetes and hypothyroidism, Monoclonal protein and Skin changes with no increase in BM clonal plasma cells and no end-organ damage), Waldenstrom’s macroglobulinemia (lymphoplasmacytic lymphoma with IgM monoclonal-protein) and metastatic malignancies (like kidney, breast and lung cancers). PCL is an advanced phase of myeloma with a plasma cell count of >2000/uL or 20% of the peripheral blood white cells. Figure 2: Some of the clinical findings seen in patients with multiple myeloma. A: Rouleaux formation on the peripheral blood film. B: Increased numbers of plasma cell on a BM aspirate. 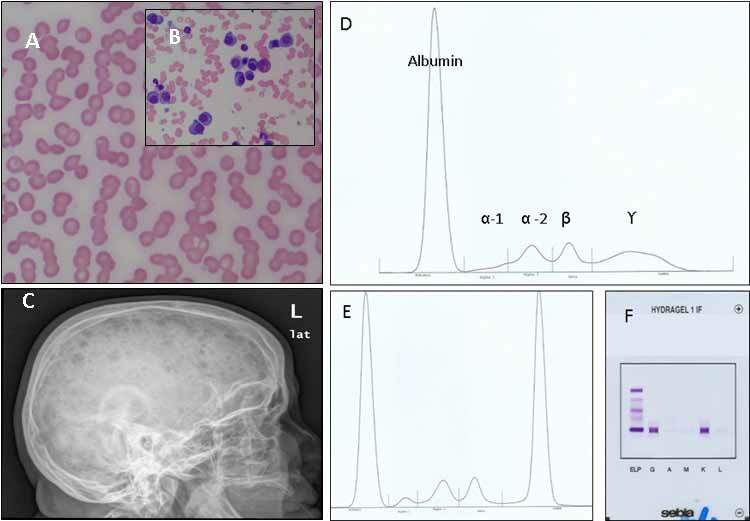 C. Lateral X-ray of the skull showing multiple lytic lesions; D, E, and F: Detection of monoclonal proteins on PEP and IF (D: normal pattern of SPEP; E: abnormal monoclonal peak in the gamma region on SPEP; F: Immunofixation identifying the M-protein as IgG kappa). Table 1: Diagnostic criteria of myeloma and related disorders. Table 2: Staging systems and prognostic markers in patients with multiple myeloma (survival times are according to the ISS). Staging is done to determine the burden of disease and to predict survival. 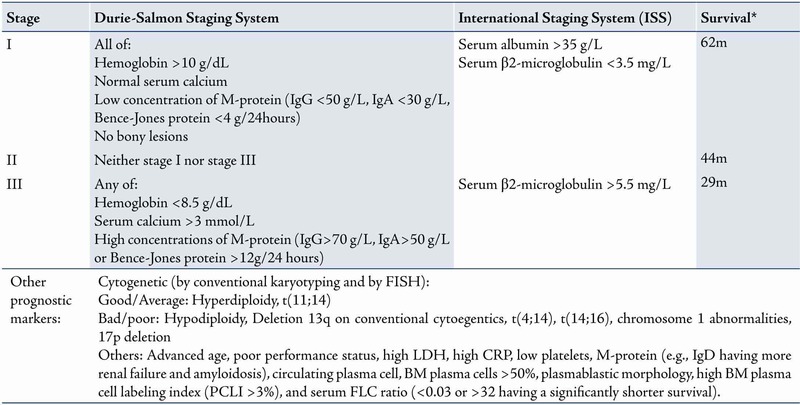 There are two main staging systems: the international staging system (ISS),15 and the Durie-Salmon staging system (Table 2).16 Cytogenetic abnormalities detected by conventional karyotyping or FISH are also important in the prognosis of myeloma. These and other prognostic factors are listed in Table 2. Guidelines are now available to guide the management of patients with plasma cell disorders in the current era with many available active agents.17,18 Historically however, treatment was based on the use of the combination of steroids and alkylating agents (typically melphalan and prednisone; MP). VAD (Vincristine, Adriamycin and Dexamethasone) later became a common initial therapy in younger patients. Most of the activity in this combination was from dexamethasone and dexamethasone alone became the regimen of choice. This group (younger patients) was later shown to have a survival advantage with autologous stem cell transplantation (ASCT) and this became the new standard of care, while MP remained the gold standard in older and less fit patients. In this era of novel agents, treatment varies depending on whether the patient is eligible for ASCT or not. Age >65, poor performance status (ECOG performance status of 3-4) and significant organ dysfunction (significant liver disease, renal disease with creatinine >220 umol/L unless on stable chronic dialysis and/or NYHA class III-IV) render patients unsuitable for such intensive therapy. The aim of therapy in these patients is to induce a rapid and deep response, reverse organ damage and decrease the burden of disease. This is done by the use of combinations of high dose dexamethasone with thalidomide (TD; Thalidomide+Dexamethasone),23,24 bortezomb (VD; Velcade i.e. bortezomib+Dexamethasone),25 or lenalidomide (Rd; Revlimid i.e. lenalidomide+low dose dexamethasone),26 or with more than one novel agent. VTD (velcade with thalidomide and dexamethasone),27 CTD (cyclophosphamide, thalidomide and dexamethasone),28 and CyBorD (cyclophosphamide, bortezomib and dexamethasone),29 seem to produce the highest response rates. Alkylating agents like melphalan should be avoided as these are damaging to stem cells and will make it difficult to collect stem cell for transplant later. After 2-4 cycles of induction therapy, responding patients undergo peripheral blood stem cell mobilization and collection using high dose cyclophosphamide followed by G-CSF.30,31 Stem cells are cryopreserved in 5% dimethylsulfoxide (DMSO) and then thawed at the time of transplant; done between 2-4 weeks after successful collection (except in cases where a delayed transplant strategy is followed, which is a valid option).32 Patients typically receive high dose melphalan 200 mg/m2 (140 mg/m2 in renal dysfunction). Stem cells are infused through a central line 24 hours later. Two large RCTs have shown increased survival by one year with ASCT in these patients.33,34 A large RCT also showed further improvement with tandem transplantation (a planned second transplant 3-6 months following the first one).35 The benefit was, however, limited to patients not achieving at least a very good partial response (VGPR) and a meta-analysis of 6 RCTs showed increased toxicity with no significant difference in overall survival (OS).36 A subset of patients might still benefit from tandem transplantation and some may benefit from a second transplant if they relapse later. Therefore, stem cells are collected for two transplants at the time of the initial collection. MPT, VMP and MPR have not been compared head-to-head in an RCT and the choice will depend on several factors like: renal function (bortezomib causes faster reversal of renal dysfunction while the dose of lenalidomide has to be adjusted in renal insufficiency), the presence and risk of peripheral neuropathy (more with thalidomide and bortezomib), the risk of thrombosis (more with thalidomide and lenalidomdie), the presence of high risk cytogenetic abnormalities (bortezomib seems to overcome some of these) and some logistical considerations (thalidomide and lenalidomdie are oral while bortezomib is given intravenously twice weekly although recent trials have shown similar efficacy with less toxicity with subcutaneous,45 and once weekly,46 dosing). With the excellent results obtained with novel agents, it seems intuitive to use something to maintain these responses for as long as possible. Thalidomide (alone or with prednisone) has been shown to improve PFS post-ACST in young patients in six studies (improving OS in three of them) and to prolong PFS in two trials in elderly patients. A meta-analysis has shown overall improvement in PFS and a marginally better OS.48 Bortezomib maintenance has also been shown to improve outcome but with no effect on OS.49 The best results with maintenance so far are with low dose lenalidomide. Two trials of lemalidomide maintenance after transplant,50,51 and one after MPR induction (the MM-015 trial),52 showed a significant improvement in PFS with an increase in OS in one of the transplant trials.51 It should be noted that achievement of an OS benefit with maintenance therapy is difficult with an increasing number of available effective salvage treatment at relapse and improvement in PFS might be a valid end-point, especially when there is improvement in quality of life. It should also be noted that maintenance therapy can be associated with some side effects related to the medications used as well as the reported increase in second primary malignancies (SPM) in these trials. The benefit therefore, has to be weighed against these risks. Thrombosis prophylaxis: Patients with MM are at higher risk of developing thromboembolism.57 Aspirin is the easiest to use and has similar efficacy when compared to other agents.58 However, thrombotic and bleeding risks should be assessed and the choice of prophylactic strategy individualized (patients with high risk for thrombosis should preferably be on LMWH or warfarin). Infection prophylaxis: Regular bacterial infection prophylaxis using daily trimethoprim-sulfamethoxazole (cotrimoxazole) or a fluoroquinolone (ciprofloxacin or levofloxacin) is controversial but is advisable in high-risk patients. Intravenous immunoglobulins should be considered in patients with recurrent life threatening infections. Prophylaxis against Pneumocystis carinii (PCP) is standard and herpes zoster prophylaxis (with acyclovir) is recommended, especially in patients getting bortezomib and those undergoing ASCT. Fungal prophylaxis is recommended in the latter group. Vaccination against viral influenza, Streptococcus pneumonia and Haemophilus influenza is also recommended although the efficacy is not guaranteed. • Hypercalcemia: Mild asymptomatic hypercalcemia (calcium <3 mmol/L) is managed by hydration and steroids while in moderate-severe cases, bisphosphonates (+/- calcitonin) are added. • Renal insufficiency: Avoidance of nephrotoxic agents, dose-adjustments and treatment of hypercalcemia are important to prevent further damage.59 Plasmapheresis in patients with predominant cast nephropathy is controversial. When indicated, hemodialysis is used. • Anemia: The use of erythropoietin or darbopoietin is recommended if hemoglobin is <10 g/dL. Hemoglobin should not be allowed to increase over 12 g/dL (risk of thrombosis).60 Patients with severe symptomatic anemia should also receive red cell transfusions. • Cord compression: This is treated as an emergency with RT plus high dose dexamethasone. Surgical decompression is only necessary if the neurologic deficit does not improve or in cases where the compression is due to a bony fragment or retropulsed bone. • Peripheral neuropathy: This is present in a minority of patients at diagnosis but is a frequent complication of treatment and progressive disease. It is managed by gabapentin or pre-gabalin, treating the disease, dose-adjustment of the causative drug and treating any concomitant B12 deficiency. • Hyperviscosity syndrome: Plasmapheresis should be done promptly to relieve symptoms if present regardless of the viscosity level and treatment for myeloma should be started immediately. • Hyperuricemia and tumor lysis: Tumor lysis syndrome is uncommon in MM. Hydration and allopurinol (dose-adjusted in renal dysfunction) is used in patients with high disease burden. Treatment of MGUS, Smoldering Myeloma and Plasmacytomas. • Thalidomide: sedation, constipation, skin rash, thrombosis and peripheral neuropathy. • Lemalidomide: thrombosis and myelosuppression. • Bortezomib: peripheral neuropathy, diarrhea and thrombocytopenia. Of note, IMiDs are given in patients of childbearing age only if they use two contraceptive methods. Steroid related side effect, myelosuppression from melphalan and side effects of other drugs are also assessed. Almost all patients with MM will relapse. Treatment at relapse depends on age, performance status and the presence of comorbidities at relapse. Patients eligible for ASCT who relapse >2 years after initial ASCT can benefit from another ASCT.65 Lenalidomdie-dexamethasone is the regimen of choice given, it yielded impressive results in the MM-009 and MM-010 studies,66,67 unless the patient has progressed on or soon after a lenalidomide containing regimen. DVD (dexamethasone, velcade and doxil; a liposomal doxorubicin with less cardiotoxicity) based on the results of the DOXIL-MMY-3001 Trial,68 or other regimens (e.g. cyclophosphamide containing regimens) could also be used. In general, the same initial regimen can be repeated if the remission was long-lasting (>1 year) and a change to a combination containing another novel agent that the patient was not exposed to is preferable in patients with short remissions. There is no standard salvage regimen and therapy is tailored according to the pace of disease and fitness of the patient. Tolerance can be improved by dose-adjustments or use of newer strategies (e.g. weekly and/or subcutaneous bortezomib). Several new agents have shown promising results in early phase clinical trials and are being explored as single agents or in combination with other agents in clinical trials like pomalidomide,70 (a new IMiD) and carfilzomib,71 (a second generation proteasome inhibitor). With better understanding of this disease and its pathogenesis, more novel agents are being discovered. With deeper responses to the currently available agents, it is not unrealistic to hope that one day in the near future, a cure will be the goal in the majority, if not all patients. No conflict of interest. I would like to thank Dr. Khalid Al-Waili from the department of biochemistry at Sultan Qaboos University Hospital for supplying the images of SPEP and IF. 1. Kyle RA, Rajkumar SV. Multiple myeloma. Blood 2008 Mar;111(6):2962-2972. Review. 2. Kyle RA, Therneau TM, Rajkumar SV, Larson DR, Plevak MF, Offord JR, et al. Prevalence of monoclonal gammopathy of undetermined significance. N Engl J Med 2006 Mar;354(13):1362-1369. 3. Kyle RA, Therneau TM, Rajkumar SV, Offord JR, Larson DR, Plevak MF, et al. A long-term study of prognosis in monoclonal gammopathy of undetermined significance. N Engl J Med 2002 Feb;346(8):564-569. 4. Kyle RA, Remstein ED, Therneau TM, Dispenzieri A, Kurtin PJ, Hodnefield JM, et al. Clinical course and prognosis of smoldering (asymptomatic) multiple myeloma. N Engl J Med 2007 Jun;356(25):2582-2590. 5. Ministry of Health. Oman. Cancer Incidence in Oman: Report of 2009. Department of Non-Communicable Disease Surveillance and Control; Directorate General of Health Affairs, 2009. 6. Lynch HT, Ferrara K, Barlogie B, Coleman EA, Lynch JF, Weisenburger D, et al. Familial myeloma. N Engl J Med 2008 Jul;359(2):152-157. 7. Landgren O, Kyle RA, Pfeiffer RM, Katzmann JA, Caporaso NE, Hayes RB, et al. Monoclonal gammopathy of undetermined significance (MGUS) consistently precedes multiple myeloma: a prospective study. Blood 2009 May;113(22):5412-5417. 8. Fonseca R, Bergsagel PL, Drach J, Shaughnessy J, Gutierrez N, Stewart AK, et al; International Myeloma Working Group. International Myeloma Working Group molecular classification of multiple myeloma: spotlight review. Leukemia 2009 Dec;23(12):2210-2221. 9. Bladé J, Fernández de Larrea C, Rosiñol L, Cibeira MT, Jiménez R, Powles R. Soft-tissue plasmacytomas in multiple myeloma: incidence, mechanisms of extramedullary spread, and treatment approach. J Clin Oncol 2011 Oct;29(28):3805-3812. 10. Kyle RA, Gertz MA, Witzig TE, Lust JA, Lacy MQ, Dispenzieri A, et al. Review of 1027 patients with newly diagnosed multiple myeloma. Mayo Clin Proc 2003 Jan;78(1):21-33. 11. Al-Farsi K, Al-Haddabi I, Al-Riyami N, Al-Sukaiti R, Al-Kindi S. Myelomatous Pleural Effusion: Case report and review of the literature. Sultan Qaboos Univ Med J 2011 May;11(2):259-264. 12. Dispenzieri A, Kyle R, Merlini G, Miguel JS, Ludwig H, Hajek R, et al; International Myeloma Working Group. International Myeloma Working Group guidelines for serum-free light chain analysis in multiple myeloma and related disorders. Leukemia 2009 Feb;23(2):215-224. 13. Dimopoulos M, Terpos E, Comenzo RL, Tosi P, Beksac M, Sezer O, et al; IMWG. International myeloma working group consensus statement and guidelines regarding the current role of imaging techniques in the diagnosis and monitoring of multiple Myeloma. Leukemia 2009 Sep;23(9):1545-1556. 14. International Myeloma Working Group. Criteria for the classification of monoclonal gammopathies, multiple myeloma and related disorders: a report of the International Myeloma Working Group. Br J Haematol 2003 Jun;121(5):749-757. 15. Greipp PR, San Miguel J, Durie BG, Crowley JJ, Barlogie B, Bladé J, et al. International staging system for multiple myeloma. J Clin Oncol 2005 May;23(15):3412-3420. 16. Durie BG, Salmon SE. A clinical staging system for multiple myeloma. Correlation of measured myeloma cell mass with presenting clinical features, response to treatment, and survival. Cancer 1975 Sep;36(3):842-854. 17. Cavo M, Rajkumar SV, Palumbo A, Moreau P, Orlowski R, Bladé J, et al; International Myeloma Working Group. International Myeloma Working Group consensus approach to the treatment of multiple myeloma patients who are candidates for autologous stem cell transplantation. Blood 2011 Jun;117(23):6063-6073. 18. Palumbo A, Sezer O, Kyle R, Miguel JS, Orlowski RZ, Moreau P, et al; IMWG. International Myeloma Working Group guidelines for the management of multiple myeloma patients ineligible for standard high-dose chemotherapy with autologous stem cell transplantation. Leukemia 2009 Oct;23(10):1716-1730. 19. Richardson PG, Barlogie B, Berenson J, Singhal S, Jagannath S, Irwin D, et al. A phase 2 study of bortezomib in relapsed, refractory myeloma. N Engl J Med 2003 Jun;348(26):2609-2617. 20. Jagannath S, Barlogie B, Berenson J, Siegel D, Irwin D, Richardson PG, et al. A phase 2 study of two doses of bortezomib in relapsed or refractory myeloma. Br J Haematol 2004 Oct;127(2):165-172. 21. Richardson PG, Sonneveld P, Schuster MW, Irwin D, Stadtmauer EA, Facon T, et al; Assessment of Proteasome Inhibition for Extending Remissions (APEX) Investigators. Bortezomib or high-dose dexamethasone for relapsed multiple myeloma. N Engl J Med 2005 Jun;352(24):2487-2498. 22. Kumar SK, Rajkumar SV, Dispenzieri A, Lacy MQ, Hayman SR, Buadi FK, et al. Improved survival in multiple myeloma and the impact of novel therapies. Blood 2008 Mar;111(5):2516-2520. 23. Rajkumar SV, Blood E, Vesole D, Fonseca R, Greipp PR; Eastern Cooperative Oncology Group. Phase III clinical trial of thalidomide plus dexamethasone compared with dexamethasone alone in newly diagnosed multiple myeloma: a clinical trial coordinated by the Eastern Cooperative Oncology Group. J Clin Oncol 2006 Jan;24(3):431-436. 24. Rajkumar SV, Rosiñol L, Hussein M, Catalano J, Jedrzejczak W, Lucy L, et al. Multicenter, randomized, double-blind, placebo-controlled study of thalidomide plus dexamethasone compared with dexamethasone as initial therapy for newly diagnosed multiple myeloma. J Clin Oncol 2008 May;26(13):2171-2177. 25. Harousseau JL, Attal M, Avet-Loiseau H, Marit G, Caillot D, Mohty M, et al. 26. Harousseau JL, Attal M, Avet-Loiseau H, Marit G, Caillot D, Mohty M, et al. Bortezomib plus dexamethasone is superior to vincristine plus doxorubicin plus dexamethasone as induction treatment prior to autologous stem-cell transplantation in newly diagnosed multiple myeloma: results of the IFM 2005-01 phase III trial. J Clin Oncol 2010 Oct;28(30):4621-4629. 27. Rajkumar SV, Jacobus S, Callander NS, Fonseca R, Vesole DH, Williams ME, et al; Eastern Cooperative Oncology Group. Lenalidomide plus high-dose dexamethasone versus lenalidomide plus low-dose dexamethasone as initial therapy for newly diagnosed multiple myeloma: an open-label randomised controlled trial. Lancet Oncol 2010 Jan;11(1):29-37. 28. Cavo M, Tacchetti P, Patriarca F, Petrucci MT, Pantani L, Galli M, et al; GIMEMA Italian Myeloma Network. Bortezomib with thalidomide plus dexamethasone compared with thalidomide plus dexamethasone as induction therapy before, and consolidation therapy after, double autologous stem-cell transplantation in newly diagnosed multiple myeloma: a randomised phase 3 study. Lancet 2010 Dec;376(9758):2075-2085. 29. Morgan GJ, Davies FE, Gregory WM, Bell SE, Szubert AJ, Navarro Coy N, et al; National Cancer Research Institute Haematological Oncology Clinical Studies Group. Cyclophosphamide, thalidomide, and dexamethasone as induction therapy for newly diagnosed multiple myeloma patients destined for autologous stem-cell transplantation: MRC Myeloma IX randomized trial results. Haematologica 2012 Mar;97(3):442-450. 30. Reeder CB, Reece DE, Kukreti V, Chen C, Trudel S, Hentz J, et al. Cyclophosphamide, bortezomib and dexamethasone induction for newly diagnosed multiple myeloma: high response rates in a phase II clinical trial. Leukemia 2009 Jul;23(7):1337-1341. 31. Kumar S, Giralt S, Stadtmauer EA, Harousseau JL, Palumbo A, Bensinger W, et al; International Myeloma Working Group. Mobilization in myeloma revisited: IMWG consensus perspectives on stem cell collection following initial therapy with thalidomide-, lenalidomide-, or bortezomib-containing regimens. Blood 2009 Aug;114(9):1729-1735. 32. Giralt S, Stadtmauer EA, Harousseau JL, Palumbo A, Bensinger W, Comenzo RL, et al; IMWG. International myeloma working group (IMWG) consensus statement and guidelines regarding the current status of stem cell collection and high-dose therapy for multiple myeloma and the role of plerixafor (AMD 3100). Leukemia 2009 Oct;23(10):1904-1912. 33. Fermand JP, Ravaud P, Chevret S, Divine M, Leblond V, Belanger C, et al. High-dose therapy and autologous peripheral blood stem cell transplantation in multiple myeloma: up-front or rescue treatment? Results of a multicenter sequential randomized clinical trial. Blood 1998 Nov;92(9):3131-3136. 34. Attal M, Harousseau JL, Stoppa AM, Sotto JJ, Fuzibet JG, Rossi JF, et al. A prospective, randomized trial of autologous bone marrow transplantation and chemotherapy in multiple myeloma. Intergroupe Français du Myélome. N Engl J Med 1996 Jul;335(2):91-97. 35. Child JA, Morgan GJ, Davies FE, Owen RG, Bell SE, Hawkins K, et al; Medical Research Council Adult Leukaemia Working Party. High-dose chemotherapy with hematopoietic stem-cell rescue for multiple myeloma. N Engl J Med 2003 May;348(19):1875-1883. 36. Attal M, Harousseau JL, Facon T, Guilhot F, Doyen C, Fuzibet JG, et al; InterGroupe Francophone du Myélome. Single versus double autologous stem-cell transplantation for multiple myeloma. N Engl J Med 2003 Dec;349(26):2495-2502. 37. Kumar A, Kharfan-Dabaja MA, Glasmacher A, Djulbegovic B. Tandem versus single autologous hematopoietic cell transplantation for the treatment of multiple myeloma: a systematic review and meta-analysis. J Natl Cancer Inst 2009 Jan;101(2):100-106. 38. Myeloma Trialists' Collaborative Group. Combination chemotherapy versus melphalan plus prednisone as treatment for multiple myeloma: an overview of 6,633 patients from 27 randomized trials. Myeloma Trialists’ Collaborative Group. J Clin Oncol 1998 Dec;16(12):3832-3842. 39. Palumbo A, Bringhen S, Caravita T, Merla E, Capparella V, Callea V, et al; Italian Multiple Myeloma Network, GIMEMA. Oral melphalan and prednisone chemotherapy plus thalidomide compared with melphalan and prednisone alone in elderly patients with multiple myeloma: randomised controlled trial. Lancet 2006 Mar;367(9513):825-831. 40. Facon T, Mary JY, Hulin C, Benboubker L, Attal M, Pegourie B, et al; Intergroupe Francophone du Myélome. Melphalan and prednisone plus thalidomide versus melphalan and prednisone alone or reduced-intensity autologous stem cell transplantation in elderly patients with multiple myeloma (IFM 99-06): a randomised trial. Lancet 2007 Oct;370(9594):1209-1218. 41. Fayers PM, Palumbo A, Hulin C, Waage A, Wijermans P, Beksaç M, et al; Nordic Myeloma Study Group; Italian Multiple Myeloma Network; Turkish Myeloma Study Group; Hemato-Oncologie voor Volwassenen Nederland; Intergroupe Francophone du Myélome; European Myeloma Network. Thalidomide for previously untreated elderly patients with multiple myeloma: meta-analysis of 1685 individual patient data from 6 randomized clinical trials. Blood 2011 Aug;118(5):1239-1247. 42. San Miguel JF, Schlag R, Khuageva NK, Dimopoulos MA, Shpilberg O, Kropff M, et al; VISTA Trial Investigators. Bortezomib plus melphalan and prednisone for initial treatment of multiple myeloma. N Engl J Med 2008 Aug;359(9):906-917. 43. Palumbo A, Falco P, Corradini P, Falcone A, Di Raimondo F, Giuliani N, et al; GIMEMA--Italian Multiple Myeloma Network. Melphalan, prednisone, and lenalidomide treatment for newly diagnosed myeloma: a report from the GIMEMA–Italian Multiple Myeloma Network. J Clin Oncol 2007 Oct;25(28):4459-4465. 44. Verelst SG, Termorshuizen F, Uyl-de Groot CA, Schaafsma MR, Ammerlaan AH, Wittebol S, et al; Dutch-Belgium Hemato-Oncology Cooperative Group (HOVON). Effect of thalidomide with melphalan and prednisone on health-related quality of life (HRQoL) in elderly patients with newly diagnosed multiple myeloma: a prospective analysis in a randomized trial. Ann Hematol 2011 Dec;90(12):1427-1439. 45. Delforge M, Dhawan R, Robinson D Jr, Meunier J, Regnault A, Esseltine DL, et al. Health-related quality of life in elderly, newly diagnosed multiple myeloma patients treated with VMP vs. MP: results from the VISTA trial. Eur J Haematol 2012 Jul;89(1):16-27. 46. Moreau P, Pylypenko H, Grosicki S, Karamanesht I, Leleu X, Grishunina M, et al. Subcutaneous versus intravenous administration of bortezomib in patients with relapsed multiple myeloma: a randomised, phase 3, non-inferiority study. Lancet Oncol 2011 May;12(5):431-440. Published online 18 Apr 2011. 47. Bringhen S, Larocca A, Rossi D, Cavalli M, Genuardi M, Ria R, et al. Efficacy and safety of once-weekly bortezomib in multiple myeloma patients. Blood 2010 Dec;116(23):4745-4753. 48. Ludwig H, Durie BG, McCarthy P, Palumbo A, San Miguel J, Barlogie B, et al; International Myeloma Working Group. IMWG consensus on maintenance therapy in multiple myeloma. Blood 2012 Mar;119(13):3003-3015. 49. Kagoya Y, Nannya Y, Kurokawa M. Thalidomide maintenance therapy for patients with multiple myeloma: meta-analysis. Leuk Res 2012 Aug;36(8):1016-1021. Published online 10 May 2012. 50. Palumbo A, Bringhen S, Rossi D, Cavalli M, Larocca A, Ria R, et al. Bortezomib-melphalan-prednisone-thalidomide followed by maintenance with bortezomib-thalidomide compared with bortezomib-melphalan-prednisone for initial treatment of multiple myeloma: a randomized controlled trial. J Clin Oncol 2010 Dec;28(34):5101-5109. 51. Attal M, Lauwers-Cances V, Marit G, Caillot D, Moreau P, Facon T, et al; IFM Investigators. Lenalidomide maintenance after stem-cell transplantation for multiple myeloma. N Engl J Med 2012 May;366(19):1782-1791. 52. McCarthy PL, Owzar K, Hofmeister CC, Hurd DD, Hassoun H, Richardson PG, et al. Lenalidomide after stem-cell transplantation for multiple myeloma. N Engl J Med 2012 May;366(19):1770-1781. 53. Palumbo A, Hajek R, Delforge M, Kropff M, Petrucci MT, Catalano J, et al; MM-015 Investigators. Continuous lenalidomide treatment for newly diagnosed multiple myeloma. N Engl J Med 2012 May;366(19):1759-1769. 54. Snowden JA, Ahmedzai SH, Ashcroft J, D’Sa S, Littlewood T, Low E, et al; Haemato-oncology Task Force of British Committee for Standards in Haematology and UK Myeloma Forum. Guidelines for supportive care in multiple myeloma 2011. Br J Haematol 2011 Jul;154(1):76-103. .
55. Kyle RA, Yee GC, Somerfield MR, Flynn PJ, Halabi S, Jagannath S, et al; American Society of Clinical Oncology. American Society of Clinical Oncology 2007 clinical practice guideline update on the role of bisphosphonates in multiple myeloma. J Clin Oncol 2007 Jun;25(17):2464-2472. 56. Lacy MQ, Dispenzieri A, Gertz MA, Greipp PR, Gollbach KL, Hayman SR, et al. Mayo clinic consensus statement for the use of bisphosphonates in multiple myeloma. Mayo Clin Proc 2006 Aug;81(8):1047-1053. 57. Durie BG. Use of bisphosphonates in multiple myeloma: IMWG response to Mayo Clinic consensus statement. Mayo Clin Proc 2007 Apr;82(4):516-517, author reply 517-518. 58. Palumbo A, Rajkumar SV, Dimopoulos MA, Richardson PG, San Miguel J, Barlogie B, et al; International Myeloma Working Group. Prevention of thalidomide- and lenalidomide-associated thrombosis in myeloma. Leukemia 2008 Feb;22(2):414-423. 59. Palumbo A, Cavo M, Bringhen S, Zamagni E, Romano A, Patriarca F, et al. Aspirin, warfarin, or enoxaparin thromboprophylaxis in patients with multiple myeloma treated with thalidomide: a phase III, open-label, randomized trial. J Clin Oncol 2011 Mar;29(8):986-993. 60. Dimopoulos MA, Terpos E, Chanan-Khan A, Leung N, Ludwig H, Jagannath S, et al. Renal impairment in patients with multiple myeloma: a consensus statement on behalf of the International Myeloma Working Group. J Clin Oncol 2010 Nov;28(33):4976-4984. Published online 18 Oct 2010. 61. Rizzo JD, Somerfield MR, Hagerty KL, Seidenfeld J, Bohlius J, Bennett CL, et al; American Society of Clinical Oncology; American Society of Hematology. Use of epoetin and darbepoetin in patients with cancer: 2007 American Society of Clinical Oncology/American Society of Hematology clinical practice guideline update. J Clin Oncol 2008 Jan;26(1):132-149. Published online 22 Oct 2007. 62. Hussein MA, Vrionis FD, Allison R, Berenson J, Berven S, Erdem E, et al; International Myeloma Working Group. The role of vertebral augmentation in multiple myeloma: International Myeloma Working Group Consensus Statement. Leukemia 2008 Aug;22(8):1479-1484. Erratum in: Leukemia. 2008 Aug;22. 8.: 1649. Randall, L. corrected to Randall, RL. 63. Kyle RA, Durie BG, Rajkumar SV, Landgren O, Blade J, Merlini G, et al; International Myeloma Working Group. 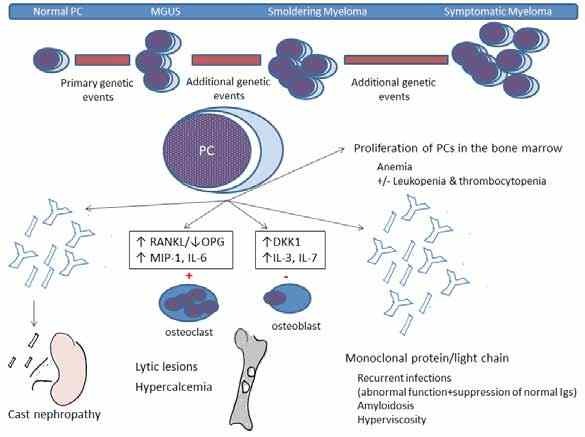 Monoclonal gammopathy of undetermined significance (MGUS) and smoldering (asymptomatic) multiple myeloma: IMWG consensus perspectives risk factors for progression and guidelines for monitoring and management. Leukemia 2010 Jun;24(6):1121-1127. 64. Soutar R, Lucraft H, Jackson G, Reece A, Bird J, Low E, et al; Guidelines Working Group of the UK Myeloma Forum; British Committee for Standards in Haematology; British Society for Haematology. Guidelines on the diagnosis and management of solitary plasmacytoma of bone and solitary extramedullary plasmacytoma. Br J Haematol 2004 Mar;124(6):717-726. 65. Durie BG, Harousseau JL, Miguel JS, Bladé J, Barlogie B, Anderson K, et al; International Myeloma Working Group. International uniform response criteria for multiple myeloma. Leukemia 2006 Sep;20(9):1467-1473. Published online 20 Jul 2006. 66. Jimenez-Zepeda VH, Mikhael J, Winter A, Franke N, Masih-Khan E, Trudel S, et al. Second autologous stem cell transplantation as salvage therapy for multiple myeloma: impact on progression-free and overall survival. Biol Blood Marrow Transplant 2012 May;18(5):773-779. 67. Weber DM, Chen C, Niesvizky R, Wang M, Belch A, Stadtmauer EA, et al; Multiple Myeloma (009) Study Investigators. Lenalidomide plus dexamethasone for relapsed multiple myeloma in North America. N Engl J Med 2007 Nov;357(21):2133-2142. 68. Dimopoulos M, Spencer A, Attal M, Prince HM, Harousseau JL, Dmoszynska A, et al; Multiple Myeloma (010) Study Investigators. Lenalidomide plus dexamethasone for relapsed or refractory multiple myeloma. N Engl J Med 2007 Nov;357(21):2123-2132. 69. Sonneveld P, Hajek R, Nagler A, Spencer A, Bladé J, Robak T, et al; DOXIL-MMY-3001 Study Investigators. Combined pegylated liposomal doxorubicin and bortezomib is highly effective in patients with recurrent or refractory multiple myeloma who received prior thalidomide/lenalidomide therapy. Cancer 2008 Apr;112(7):1529-1537. 70. Lokhorst H, Einsele H, Vesole D, Bruno B, San Miguel J, Pérez-Simon JA, et al; International Myeloma Working Group. International Myeloma Working Group consensus statement regarding the current status of allogeneic stem-cell transplantation for multiple myeloma. J Clin Oncol 2010 Oct;28(29):4521-4530. 71. Lacy MQ, Allred JB, Gertz MA, Hayman SR, Short KD, Buadi F, et al. Pomalidomide plus low-dose dexamethasone in myeloma refractory to both bortezomib and lenalidomide: comparison of 2 dosing strategies in dual-refractory disease. Blood 2011 Sep;118(11):2970-2975. 72. Vij R, Wang M, Kaufman JL, Lonial S, Jakubowiak AJ, Stewart AK, et al. An open-label, single-arm, phase 2 (PX-171-004) study of single-agent carfilzomib in bortezomib-naive patients with relapsed and/or refractory multiple myeloma. Blood 2012 Jun;119(24):5661-5670. 73. Rajkumar SV. Treatment of myeloma: cure vs control. Mayo Clin Proc 2008 Oct;83(10):1142-1145.